Opis: Tonight, those blessed with clear skies can enjoy a glorious full moon, the last full moon of the "Y1.9K"s. In fact, tonight's moon will be a full-perigee-solstice moon, reaching its full phase and perigee (the closest point in its orbit) on the solstice, the first day of northern hemisphere winter. Anticipation of this celestial event has generated a flood of e-mail chasing the rumor that the full-perigee-solstice moon will be intensely bright. However, calculations show it will only be a little brighter than usual, and certainly not dramatically so. Why would it be brighter? Mostly because the moon appears bigger and brighter at perigee. 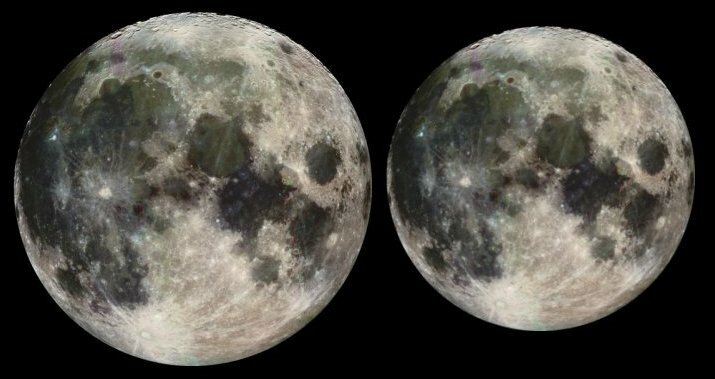 The above illustration, based on Galileo spacecraft images, shows the approximate difference in apparent size between a full moon at perigee (left) and a full moon at apogee, the farthest point in the lunar orbit. The Earth and moon are also a few percent closer to the sun during northern winter, but the combined effects will cause tonight's full moon to appear only about 20% brighter than an average full moon. That difference is not even likely to be noticeable to the human eye.